Alia Intriago Ycaza, a sixteen year old who was born in Ecuador Guayaquil, was told on April 3, 2008, that her family was heading for America because of her father’s job. Who would have thought that six years later, after having adapted to American life, she would have the opportunity to live in yet another country. Alia was about to find herself in the holy land of Israel, living in a town called Hod Hasharon, where her new high school was located. One of the hikes that AMHSI students partake in is four days long and it allows them to travel on foot from the Mediterranean to the Kinneret. Throughout this empowering trip, I was able to get to know the people I would be spending the next four months with much better, including one of my roommates, Alia. During the free time on the hike, I was able to get to know who she was, her opinion on the school, and how she feels about life in Israel so far. My mom, dad, brother, and dog, Shadow, all live in Miami, Florida. The rest of my family is still in Ecuador. During my free time, I love going to the beach and hanging out with my friends in Miami. 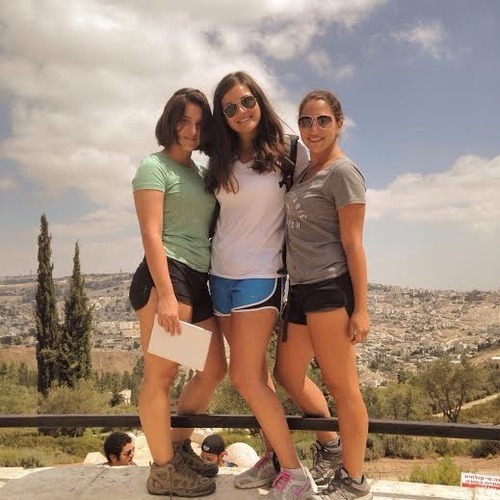 At AMHSI I like going to town with friends and hike throughout Israel. What are your favorite types of music? A favorite TV show? A favorite movie? I love rap and hip-hop music! My favorite movies include Forrest Gump and Jersey Boys. My favorite TV shows… I can’t really say, well, because there is no Netflix in Israel. Do you have any favorite subjects in school? English is one of my favorite subjects. Right now I’m taking American literature and we’re studying a lot of poetry and stories and I love it. I’m also in AP psychology, which is a passion of mine. Do you enjoy school in general? Not specifically Alexander Muss. Yes, I enjoy school. Some days yes and some days no, but I think a lot of people feel this way about school. I usually enjoy school because I love learning. I think that’s what life is all about, learning something new each day. Have you ever been to Israel other than now? No, this is my first time, and I’m very excited to be here. Why did you decide to come to Muss? Why now? My parents gave me the idea last year after my brother had done this program and loved it. I have been interested in the Jewish religion for a long time and the country is beautiful. When I got here, I thought about all of the amazing things my brother told me about HSI and he was right. What were your first thoughts on the school and have any of those thoughts changed? I was so nervous about how boarding school life would be. But now I love it, and I love my roommates. The boarding school aspect is so much fun that I have decided to be in a boarding school for the rest of my high school career. How would you compare school in America to school in Israel? Schools in America typically do a lot of things by the book and don’t really personalize the curriculum or how they teach you. Here at AMHSI, it’s more personalized. It’s one-of-a-kind school. If your teachers feel like you aren’t doing your best, they will push you and will be on your case to make sure you are living up to your potential. In Israel there is a huge support system, but in America I feel that if you fail, you’re stuck. There are so many students in my American school that it just seems like the teachers have a hard time keeping track of everyone. Where do you feel you belong at this time in your life and why? Well, home is where the heart is, and I feel like my home is here. I can relate to the culture. I can relate to how people live and how people care for each other here and that’s why I want to stay in Israel for as long as I can. I’m actually thinking about staying at Alexander Muss for another semester because I love it so much. Do you practice any sort of religion? No, I don’t celebrate any holidays or associate myself with any religion at this point in my life. Yes, after this program, I am going to look into converting to Judaism, and I hope to celebrate the holidays. Do you enjoy learning about Judaism in our Torah studies class/traveling to learn more as well? Why? I do, and not only because I want to convert, but because I want to be educated about such a powerful religion that has been around for such a long time. What do you hope to get out of studying in Israel? I hope not only to get friends that last a lifetime, but also a better education, which so far has been really successful. Do you feel any personal connection with Israel yet? Why? I definitely feel a large connection. I love the culture here. I like how people live, and I just feel like I belong here. What is your opinion on the teachers and workload at school and why? The workload could be a little hectic and stressful sometimes, depending on how many classes you’re taking but it’s pretty balanced. The teachers are very nice and hardworking. They give you the right amount of attention, and it helps me with my academic work a lot. If you were to talk to a student your age, who is thinking about doing a study abroad program what advice would you give them? Not really, I’m still finding myself here, and that’s what this trip is about for me. It’s for me to discover what I’m passionate about and who I want to be.